French & Outside Balcony, 226 sq. ft.
Balcony staterooms feature private Twin Balconies - a French Balcony plus a full size step-out balcony, and a vast array of in- room amenities. They have a queen-size bed, sitting area with chair, desk and vanity, and bathroom with shower. All staterooms include complimentary bottled water replenished daily, individual climate control, in-room safe, hair dryer, robe and slippers, mini- bar, telephone and a flat-screen television. Your bathroom offers toiletries including soaps, body wash, shampoo, conditioner and body lotion. French & Outside Balcony, 334 sq. ft.
Suites feature private Twin Balconies - a French Balcony plus a full size step-out balcony, and a vast array of in-room amenities. They have a queen-size bed, large sitting area with sofa, desk and vanity, and spacious bathroom with double sinks and separate tub and shower. All staterooms include complimentary bottled water replenished daily, individual climate control, in-room safe, hair dryer, robe and slippers, mini-bar, telephone and a flat-screen television. Your bathroom offers toiletries including soaps, body wash, shampoo, conditioner and body lotion. 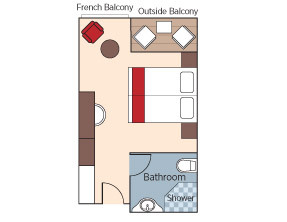 French & Outside Balcony, 452 sq. ft. Luxury Suites feature private Twin Balconies - a French Balcony plus a full size step-out balcony, and a vast array of in-room amenities. They have a king-size bed, large sitting area with sofa and chairs, desk and vanity, and spacious bathroom with double sinks and separate tub and shower. All staterooms include complimentary bottled water replenished daily, individual climate control, in-room safe, hair dryer, robe and slippers, mini-bar, telephone and a flat-screen television. Your bathroom offers toiletries including soaps, body wash, shampoo, conditioner and body lotion. DAY 1: HO CHI MINH CITY – EMBARKATION. DAY 2: CAI BE – SA DEC.
DAY 3: TAN CHAU – BORDER CROSSING. DAY 5: PHNOM PENH – KOH CHEN. Day 6: OUDONG – KAMPONG TRALACH. DAY 7: KAMPONG CHHNANG – TONLE SAP LAKE. DAY 8: TONLE SAP LAKE – DISEMBARKATION. Siem Reap Disembarkation Day: During low water season, disembark the ship at Preak Kdam, a small village on the Tonle River, and transfer via motor coach to Siem Reap. Day 4 - Phnom Penh: No bare shoulders or shorts for ladies during the Royal Palace visit. Gratuities, laundry, shop purchases and other personal expenses. Note: Gratuities - Recommendation: USD$10 pp/ night for the entire crew and USD$ 3.00 pp/night for the Cruise Director onboard. 2 night hotel* accommodation in Ho Chi Minh City) Saigon with buffet Breakfast. Welcome to Ho Chi Minh City, Vietnam’s largest city is an industrial, cultural and educational hub, but still retains vestiges of its colonial past. After checking in to your hotel, the rest of the day is at your leisure. DAY 3: HO CHI MINH CITY – EMBARKATION. 3 nights hotel* accommodation in Siem Reap with daily buffet Breakfast. Day 1: SIEM REAP – ANGKOR. Day 2: SIEM REAP – ANGKOR.